In keeping with our focus this weekend on the Post-2015 agenda, another event worth reflecting on was the workshop ‘Public Service Excellence for the Post-2015 Development Agenda’ which brought together over 80 participants from 33 countries. Co-sponsored by the UNDP Global Centre for Public Service Excellence (GCPSE) and the Effective Institutions Platform (EIP) the workshop was held in Singapore from 17-19 November 2014. Cat lead, designed and facilitated the second day of this event, targeting in particular the future of the public service, the public sector and the government. 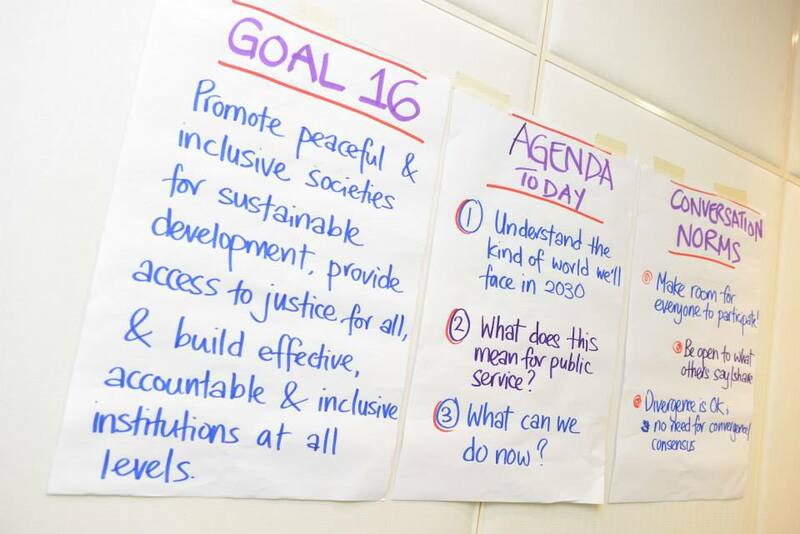 She shared her reflections on the dialogue in a previous post, however the overall themes of the event are worth recalling as they reveal the issues around which discussions of the post-2015 agenda have revolved and who is shaping this conversation. agree learning topics for the establishment of Learning Alliances on Public Sector Reform between several EIP members and/or GCPSE stakeholders. Day one began with series of keynotes, starting with a reflection on the incoming Sustainable Development Goals (SDGs) and how public sector institutions currently feature in the draft SDGs. This stock-taking was then contextualized through revisiting past public sector reform efforts in developing countries and the existing evidence on their impact. On day two, which Cat facilitated, participants engaged in a foresight exercise – taking on the personalities of citizens and government officials in the year 2030 – the target year for achievement of the SDGs. After considering governance in 2030 from these standpoints, participants explored key features and preferred attributes of the public service in 2030 and discussed how such a preferred future could be pursued now, forming groups around the most popular proposals made. On the third and final day of the workshop, participants were introduced to peer learning and learning alliances through the EIP. They had the opportunity to continue their reflection on learning from others. They discussed the gaps in the existing evidence base and identified areas for further research and exploration that can help public service reformers and their organizations in the endeavour to make the public service ready for the post-2015 agenda. Explore how the effectiveness of public institutions can be better measured to support the intent of draft SDG Goal 16. Support structured peer learning, through the Effective Institutions Platform. Provide support for the development of technology to present a narrative methodology that can capture both civil service motivation and public perception of it. Build the research/evidence base on what works in public service reform around the GCPSE’s four themes. Challenge conventional thinking as seems necessary to improve SDG results. For further details on the workshop, please see the event capture here.